First, he believes truly insane conspiracy theories. Second, he hates Mel Zelaya so much that he's willing to peddle insane conspiracy theories he knows are loony. Third, as RNS guesses, he's positioning himself for lucrative consulting money from Honduran elites. Here is the crux of his argument. The Cartagena Accord is Hugo Chávez's way of taking over Honduras and making it into a narco-state for the sake of Hezbollah. I promise I am not making that up. Just read it, and soak in the conspiracy. The problem, though, is that this isn't even a good conspiracy theory. On a side note, President Juan Manuel Santos must really be in the conservative doghouse if the right in the United States can't even mention his name (he was, of course, the other driving force of the agreement along with Chávez, which seriously undermines Noriega's rant unless he now sees Santos as somehow hypnotized by Chávez). Now even Honduran President Porfirio Lobo is in the doghouse. The Supreme Court upheld Arizona's 2007 law requiring businesses to use E-Verify. I've written about this numerous times in the past, and as yet my conclusion hasn't changed. E-Verify can potentially be an effective tool for enforcement, but is still extremely expensive and loaded with onerous bugs. E-Verify provides American employers who want to do the right thing with a straightforward tool to do so. Just like the red push-button marked “easy,” E-Verify easily confirms legal workers with just a click of a mouse. I suppose many people will believe that, despite facts. We will end up more mired in the current situation, with haphazard enforcement and growing frustration on all sides. In 1625 the Dutch city of Breda surrendered to Spanish forces after a 10 month siege. Ten years later Diego Velázquez painted The Surrender of Breda. Arturo Pérez-Reverte's The Sun Over Breda is part of the Captain Alatriste series and is an account of the siege. In typical fashion, famous Spanish figures make an entrance, as the narrator, young Iñigo Balboa, relates how he talked to Velázquez while he was painting it, and early in the novel also helps Pedro Calderón de la Barca save books from a burning library. At the end of the book, there is even a brief fictional academic essay about which figure in the painting might be Captain Alatriste. I really like the series (a past review is here), though this particular book will disappoint if you're looking for action. The plot itself is really the siege, so you already know how that will come out. But in Captain Alatriste, Pérez-Reverte has created a character that embodies the Spanish Golden Age, with its obsession with honor and loyalty accompanied by a growing recognition that things are getting worse. The narrative focuses on the sweat, dirt, pain, and perseverance of ill-paid soldiers. He who kills from afar knows nothing at all about act of killing. He who kills from afar derives no lesson from life or from death; he neither risks nor stains his hands with blood, nor hears the breathing of his adversary, nor reads the fear, courage, or indifference in his eyes. He who kills from afar tests neither his arm, his heart, nor his conscience, nor does he create ghosts that will later haunt him every single night for the rest of his life. He who kills from afar is a knave who commends to others the dirty and terrible task that is his own (p. 163). Appropriate, though entirely coincidental, that I finished reading it on Memorial Day. That was Arturo Valenzuela's response to Andres Oppenheimer's column on China's role in Latin America (which I criticized here). Oppenheimer didn't really have any good counter-response because I don't think there is one. The L.A. Times says Latin American inflation is a problem while Reuters says it seems not to be a problem. No one can really seem to agree whether demand for commodities, which is an important element of current inflationary pressure, is leveling out or not, or how effectively Latin American governments can respond. 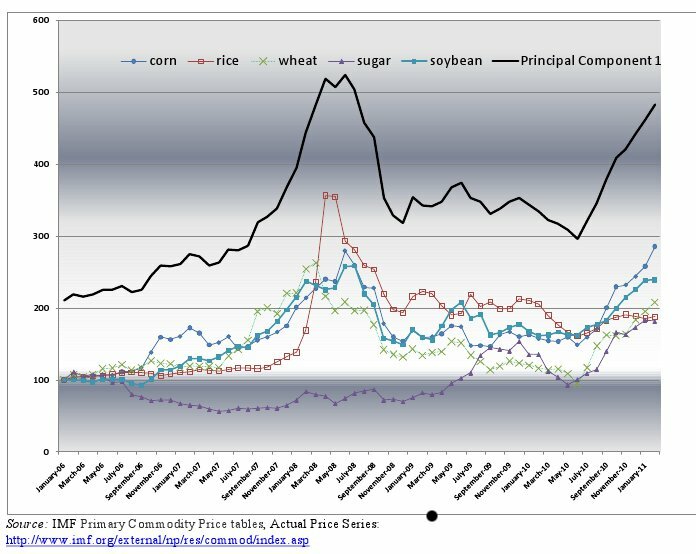 A recent IDB report on food prices has an interesting table on the prices of some key agricultural goods. So there is definitely an uptick, but there is plenty of disagreement about what direction those prices will continue going. The IDB's take is that countries with more flexible exchange rates won't see prices increase as much. The current flap between the United States and Venezuela, where the U.S. is imposing sanctions on PDVSA, almost immediately brought up the elephant in the room: co-dependency. The U.S. sanctions PDVSA, but this only prevents it from pursuing contracts in the U.S. and getting credit and licenses. They very specifically have no impact on the flow of Venezuelan oil to U.S. consumers, who don't care where their gas comes from as long as it doesn't keep going up in price. Meanwhile, Hugo Chávez got so mad that he started...tweeting. That included threatening (as he periodically has done over the years) to cut off oil exports. But he can't do so without seriously disrupting the Venezuelan economy. Venezuelans don't care who they're selling to as long as the revenue comes in. Americas Quarterly makes the interesting point that the U.S. is also sanctioning companies in Israel and the United Arab Emirates. It is in reference to the fact that Nashville is seeing fewer deportations through the 287(g) program. As with the estimated leveling off of the undocumented immigrant population in the United States, it is due to a combination of recession and enforcement, in addition to the fact that the Hispanic population in Tennessee (and the rest of the South) could not keep growing as fast as it was, so the high rates were never sustainable. His point raises an interesting policy angle, namely that opponents of 287(g) could reasonable argue for termination of the program once deportations dropped to a certain level. You could even include sunset provisions in the legislation. Andres Oppenheimer argues that the way to reduce China's share of trade in Latin America is for the United States to create "an ambitious plan" for Latin American universities. You are correct: that makes very little sense. But it emphasizes a problem for those who argue the Obama administration needs a new grand policy vision. The FTAA? It was a failure and is generally seen as an example of the tone deaf nature of the Bush administration as it tried to force the negotiations. That is not a model to be followed. China is gobbling up Latin American economies, and would be doing so even if Obama had announced a grandiose vision. Iraq, Afghanistan, and the Arab Spring (all distractions) would still be happening too. Fear of being supplanted by China should not lead us toward vague grandiosity. My impression of the Cartagena Accord, which allows for Mel Zelaya's return to Honduras, is positive. For a translation and discussion you should read this post at Honduras Culture and Politics. This is really the moment of truth for the Frente Nacional de Resistencia Popular, or FNRP. Some resistance groups--even armed ones--have become parties and entered the formal political process with tremendous success, but there is always considerable internal disagreement about whether becoming a political party will lead to real change or will be selling out to the establishment. One difference in Honduras to other prominent examples (e.g. the FMLN and FSLN) is that although there was a coup, there was no protracted civil war or extended military dictatorship. There is a pretty large literature on post-civil war transformations, but that does not fit Honduras too well. The FNRP is not a guerrilla organization that has to give up armed struggle. There is also a lot written on how ethnic movements become parties. See, for example, Donna Lee Van Cott's book From Movements to Parties in Latin America. She argues that more open institutional rules augur well for ethnic movements to successfully become parties, when combined with deteriorating linkages to existing parties and strong leadership in the movements. In Honduras it is reasonable to argue that the first two conditions are present. As for the third, the FNRP is not an ethnic movement, and so the key factor is whether the leadership can keep it together as an organization that is for certain policies as opposed to being against the government. Ethnic identity is by no means a guarantee of unity, but it provides for a sense of commonality that the FNRP will have to continually generate. The FNRP's political committee issued a statement praising the Accord, so we will have to see whether it remains unified over the long term. The South Carolina legislature is debating an anti-immigrant proposal modeled after Arizona. One of its components is actually to direct people to sue any local government that they feel is not enforcing it. So one of the poorest states in the U.S. actively wants people to drain the state's own resources and give it directly to lawyers. You can get a good sense of the level of discussion by the fact that there is a self-proclaimed "Confederate Cuban" who believes that undocumented immigrants are criminals. If you like Paco Ignacio Taibo II, then you may well like Luis Sepúlveda's The Name of a Bullfighter. In fact, Sepúlveda thanks his friend Taibo. The book is so similar in style: hardboiled crime fiction that is much more intent on evoking images, even very political ones, than on creating intricate plots. What makes Sepúlveda intriguing is that his theme is Chile as it moved from dictatorship to democracy, and that makes the book darker than Taibo's. The author was exiled in 1975 and still lives in Germany. The story centers on World War II-era treasure that is hidden in Tierra del Fuego, and how various unscrupulous people are after it. The disillusionment of radical leftists permeates the entire novel--they see the disaster of Marxism (as well as the violent battles between different Marxist models) and in Chile also see a democracy without justice. The only soft spot of the main character is his former girlfriend, now mute and vacant due to brutal torture by the Chilean military. Everything else is, as he puts it, "the bitterness I camouflage as toughness" (p. 197). The guy was right. It was a democracy. He didn't even bother to say that they had restored democracy, or that democracy had been restored. No. Chile "was" a democracy, which was the equivalent of saying the country was on the right track and anyone asking awkward questions could dislodge it from the correct. Maybe this same guy had made his career, in part, in prisons that never existed, with addresses no one can remember, interrogating women, old people, adults, and children who were never arrested, with faces no one can remember, because when democracy spread her legs to let Chile inside, she named her price beforehand, and demanded payment in a currency called forgetting (p. 148). Sebastián Piñera gave his presidential address today--here is the text, complete with subheadings. It is a strikingly comprehensive speech. How often do presidents include a discussion of how they've worked to encourage tourism? --Can't agree more with his discussion of defense, where he discussed both getting rid of the Copper Law and reforming the Code of Military Justice. Since he also brought up human rights and noted the abuses of the dictatorship, he did not throw a bone at all to the far right and retired officers. --He took a direct swing at Evo Morales for his comments about the border dispute. It is hard to resist a little nationalist fervor, especially with Bolivia. --He mentioned the problem of narcotrafficking, and it is an unfortunate sign of the times that this is increasingly becoming part of Chilean presidents' speeches. --Does anyone really ever pay attention when presidents make extravagant claims like creating one million jobs? Piñera made that claim, said he achieved less than half, and declared victory. His approval rating is currently at 41%, with 49% disapproval, so it seems that Chileans are not necessarily convinced that the past year has been quite so "fecundo y promisorio." Thanks to Andrés Velasco for this article, which in many ways sums up what I've been arguing fairly regularly for over six months regarding the irrational exuberance about Latin American economic growth. But a respected former Finance Minister of Chile may hope to have some more impact. But today’s situation shares two features with the earlier episodes of financial euphoria over Latin America: sky-high commodity prices and cheap international money. In fact, for many of the region’s countries, the terms of trade are higher and the relevant global interest rates lower than they have ever been. These factors, more than any virtuous policy change in recent years, are propelling growth. The problem is that governments in the region have yet to realize that countercyclical fiscal policy implies rowing against the current in both parts of the cycle: spending more when times are bad (the easy part) and spending less when times are good (the true test of virtue). Today, fiscal policy remains too expansionary in virtually every Latin American country. That fiscal impulse, coupled with high commodity prices and abundant credit, continues to fuel economic growth today – often at the expense of stability and growth tomorrow. Latin America’s time has finally come, too many pundits will keep saying. If only they were right. On this, I agree to a point, though I think he is pointing primarily to places like Venezuela with a high level of clientelism. You can still spend in good times as long as you are spending on the right things, particularly in terms of encouraging movement away from dependence on commodities. The key takeaway point, though, is that excitement over GDP growth, leading to talk about how some Latin American economies should be viewed as "models," is short-sighted because it consciously ignores serious underlying weaknesses. Even as the binomial system comes closer to its demise, so does the Chilean Copper Law. Sebastián Piñera is sending a bill to Congress to end it (the headline of the article unhelpfully mentions that he signed it, as if that made it a law). Piñera already shifted control of the funds to the Ministry of Finance, and I had wondered whether that meant he would sit on it for a while, but he's not (and, after all, with a single four year term Chilean presidents can't sit on anything too long). It certainly has an excellent chance of passing with the Concertación and fiscal conservatives on board. Opposition will come from those on the far right tied to the military, as well as nationalist sentiment, potentially with concern about conflict with Peru. The purported aim of John Thorn's Baseball in the Garden of Eden: The Secret History of the Early Game is to settle the question of where baseball originated. Was it purely American (and therefore virtuous according to its advocates 100 years ago) or did it derive from English rounders (and therefore unoriginal)? The depth of research is truly impressive, as he digs all the way from archives into classified ads in obscure northeastern newspapers. But he solves the question about one-third through the book--clearly it evolved from rounders, and the Manhattan variation of Base Ball managed to dominate (because, as Thorn points out, that version was claimed as "manly" while also "easier for unathletic clerks to play" (p. 48). Over time, "soaking" (hitting someone to make an out) was phased out, and the pitcher had to stand further back. I actually found other elements of the book more interesting, and even provocative. Thorn argues that, despite all the nostalgia, baseball succeeded largely because of gambling. Without the wagering, the crowds would not have come, the money would not have flowed, and the game would have foundered. Gambling, of course, became a scourge, but he argues it created baseball in the first place. Indeed, if anything his overall argument is that our national pastime is based on baseness, and very successfully so. He doesn't raise the issue of Barry Bonds, Mark McGwire, or any other modern player in that regard, but in painstaking (and in often "I need to skim this paragraph" detail) he discusses the plotting going on in the background. That could be economic, political, or even religious. Did you know how central Theosophists were in baseball's origins? Me neither. It does not really matter much, but peels back some layers of historical impurity we like to pretend don't exist when we look at current players. --for over 100 years, people have said baseball was better in the old days. A comment from the 1870s noted the game "not being as lively as it was ten years ago" (p. 153). --the debate over whether to wear your socks high or low was also a big deal in 1867 (p. 138). Discussion over reform of the binomial system continues in Chile. Claudio Fuentes, who has been writing about this regularly over past months, notes the changing political calculations of the center-right National Renovation Party. In particular, RN may believe the electoral system is benefiting the right wing UDI party at its expense. Plus, since it is no longer in the opposition RN may be looking more at gaining a majority rather than simply acting as a veto player. It is noteworthy that just two years ago while it was still in opposition, the right blocked reforms. This is a "stay tuned" situation but there seems to be a certain amount of political momentum gradually building. Mike Allison pointed out the fact that the U.S. Congress voted not to declassify documents related to the 1976-1983 dictatorship in Argentina. We know that this decision is based on the fact that they show explicitly how the U.S. government lavished praise on brutal tyrants and essentially said torture was fine while hypocritically talking in public about democracy. Check out the National Security Archive for some declassified State Department documents on Argentina. However, people can't say that, so instead the argument is that it would distract U.S. spies from from the fight against Al Qaeda. The debate hasn't been published yet in the Congressional Record, so I will have to wait to see if anyone offered anything else, but I do have to say that such an argument makes absolutely no sense at all. So what do members of the Colombian military do after receiving training from the U.S.? At least some join Blackwater to become part of a private militia intended to support and protect autocracy in the United Arab Emirates. The NYT notes, in fact, that Colombians are particularly desired because they aren't Muslim. The head of Blackwater isn't convinced that Muslims will kill Muslims if needed, but is not worried about Colombians in that regard. The UAE is concerned about Iran, but seemingly equally (or maybe more, given events elsewhere in the Middle East) concerned with having enough Colombians and South Africans to attack labor camps and ensure no democratization movement gets going. China is recognizing that Latin America is mostly exporting primary products, and that manufactured goods would be preferable. Its solution: use more Chinese government money to make products China wants to sell to the Chinese market. As it turns out, this is also preferable for China because demand for commodities is slowing down there. One interesting part of reading Chinese sources about this is how they do not even bother putting investment in a context of fighting poverty, empowering people, etc. They focus on whether it is in China's economic interest. Sort of refreshing in a way. I generally like Hillary Clinton's speech yesterday on Latin America. It is refreshingly free of references to Hugo Chávez, Iran, or other typical boogeymen. Instead, it focused on inequality, tax reform, immigration reform, crime, and education. In other words, real problems. Plenty of people are complaining about the Obama administration's approach to Latin America, but I would argue that it is useful just to continue the shift away from a security-obsessive message to one that actually addresses Latin American concerns (which, incidentally, are not about Hugo Chávez). 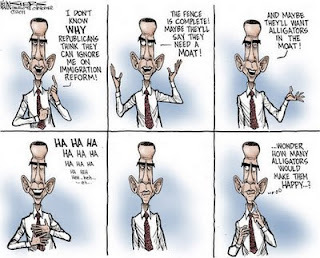 With yesterday's speech on immigration, President Obama is essentially doubling down on enforcement. I have written numerous times that I do not believe this strategy will work because no amount of enforcement is sufficient to change anyone's minds. Yet here is the strange part: Obama acknowledges that fact. That's a good line, but it therefore seems counterproductive to trumpet enforcement since it satisfies no one. Obama's other lure is economic, making case that the middle class and companies alike will benefit from immigration reform. Hard to see that getting much traction, but it's worth a shot. Last time I wrote about commodities and economic growth, I got some good comments that are worth expanding on a bit. In particular, there is the question of the potentially positive consequences of a decrease in commodity prices, which otherwise are problematic for countries that are highly dependent upon them. As commodity prices drop, so will inflationary pressures. Chile might be experiencing that now. Across the region, inflation is not high by historical standards but has been going up. 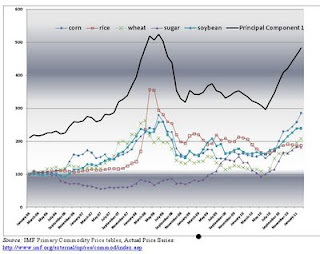 Lower inflation and lower commodity prices may also reduce the price of food. We're not seeing that yet, and let's hope global warming does not counteract the benefits. Commodity booms often entail currency appreciation (check out Brazil and Chile in this graph). If that is reversed then other exports can become more competitive. Currencies do seem to be slipping, but the $100,000 question is whether industrial exports will make up for the loss of revenue from commodities. So the glass need not always be half empty. Nonetheless, the underlying problems of dependency remain serious. Really interesting article in the New York Times about the use of cellphones to cross the U.S.-Mexico border illegally. It is a bit surprising that this is so new. With regard to the border, considerable attention is paid to technology, and yet this is one of the most basic, cheap, and widely available technologies. Regardless, this development should remind us that as long as there is demand for employment in the United States, the supply of labor will meet it one way or another (or in the case of the migrant interviewed in the story, eight ways or another). It is truly that simple. To reduce the number of fatalities among border crossers, a University of San Diego professor, Ricardo Dominguez, has been developing a cellphone application to help guide illegal immigrants to water stations and other points of safety. "I do not see any conventional military threat to the United States from the region," General Douglas Fraser told a conference organized by the University of Miami. "So my concerns then become... very non-traditional. Good for him. This should be obvious, but we hear far too many voices claiming Cuba, Venezuela, et al are security threats. And what about all the Iran paranoia? Fraser noted that Iran had almost doubled the number of embassies in the region in the past five years, established cultural centers in 17 countries, and is supporting anti-US efforts in the area." But, he said, "from a security standpoint, I have not seen a significant connection. My primary concern remains their historic relationship with Hezbollah." The more we repeat this, the better. Let's stop obsessing with Hugo Chávez, Iran, etc. and focus on real threats, which revolve around drug trafficking and gangs. I am still dubious about the Hezbollah threat, but it is far preferable to call it a "concern" rather than a "threat." Commodities prices fell sharply on Thursday, led by the steepest drop in oil prices since the fall of 2008. Investors dumped commodities like silver and coffee and sugar that had seen a vast — and some said worrying — build up in prices within the last year on expectations of strong global demand. “You’re in a situation where a lot of these markets have pushed to all-time highs and it’s at a point where it became very unstable and that’s where you started to topple,” said Dax L. Wedemeyer, a broker analyst with US Commodities, a brokerage firm West Des Moines, Iowa. So we'll wait and see what the growth numbers look like later this year. I recommend Frank Bajak's article on Alan García's role in the Peruvian presidential elections. It can be summed up with three words: ego, ego, and ego. Really, the strangest part of it all is how an individual who is so unpopular and has enacted so many disastrous policies, and who now credits Pope John Paul with Osama bin Laden's death, has any influence at all. The International Monetary Fund issued its Regional Economic Outlook for Latin America. The overall conclusion is that growth is based largely on commodity exports, demand for which has created a risk of overheating. Tucked in there is the acknowledgment that high commodity prices include food and that high food prices make people go hungry. What to do? School lunches within the "established budget envelope" without stimulating demand. Who knew hunger was so easily solved? Rising global prices of commodities, especially food, pose an important social challenge across the region. This applies even to countries that are net exporters of commodities and food, the report said. To protect the poor, policies should focus on scaling up proven social safety net programs, such as targeted income transfers, school lunches, and child nutrition programs. Generalized price subsidies should be avoided as these measures are often very costly and regressive, and can turn out to be permanent—requiring large adjustments to other parts of the budget. The expansion of safety nets should take place within the established budget envelope, in some cases to avoid stimulating demand (South America), while in other cases to rebuild the policy buffers (Central America and the Caribbean). But Rubio and other economists said revelations of such hard work by Mexicans is not really good news — rather it is a symptom of underdevelopment and inefficiencies. “The environment in which they work tends to demand more work, more hassle and more complexity to arrive at a similar result,” Rubio said. “In other words, productivity is lower in Mexico because there are so many obstacles to efficient work,” such as the mountains of red tape produced by a sprawling government and corporate bureaucracy. So working harder does not get you much further along. First, lots of people talking about how much this matters for Barack Obama in 2012. Maybe, but go back to this oldie but goodie from January 1989: the New York Times proclaimed "Approval of Bush, Bolstered by Panama, Soars in Poll." Bush Sr. was bigger than Elvis for a while. Yes, invading a small Central American country is not as exciting as killing OBL, but there is still a long way to go until the next presidential election. Long enough that it is very premature to say with much confidence how a big foreign policy boost will affect voters' feelings that far ahead. Second, killing a highly symbolic leader is certainly important, but we should be careful not to overstate how it changes everything. In Colombia, the government has killed such FARC leaders as Mono Jojoy, but that does not end the insurrection. The FARC, like Al Qaeda, is being weakened not only by military strikes but also--and this is critical--by domestic and international condemnation. Killing their leaders, however, does not suddenly end the battle. When I heard the news about Osama bin Laden, two Latin America-related thoughts came to mind. First, when the CIA hunted down Che Guevara, they took photos and even cut off his hands. This was done on purpose: they wanted to prove beyond a shadow of a doubt that he was dead. Nobody ever questioned whether it was really him. But now OBL's body was thrown into the sea, which will spawn endless conspiracy theories. Well, maybe that's not so bad, as they could be entertaining. Second, if we are lucky then this will take some air out of the conspiracy theories regarding Al Qaeda's infiltration of Latin America. Unfortunately, we probably won't be lucky, and of course you can just blame Hezbollah instead. These conspiracy theories are not entertaining, as they can lead to bad policy. Unfortunately, the increased Americanization of the Latin American diet may someday make the Latino health paradox a thing of the past.